Make way Snooki, there's another reality TV star setting foot in South Park. Honey Boo Boo is on the way! The TLC tiara'd toddler is set to be featured in this week's episode of South Park, titled "Raising the Bar." It was probably just a matter of time before Honey Boo Boo arrived in South Park. Pageant participant Alana Thompson first appeared on TLC's Toddlers & Tiaras, and has since parlayed that exposure into her own TV show at the network. And now she'll be immortalized in animated form in this week's South Park ("Raising the Bar.") In the clip below, she and her mother are at a pig farm. Honey Boo Boo is picking out pig heart with pizzazz that knows how to work it (girl)." Things will probably only get worse from here. 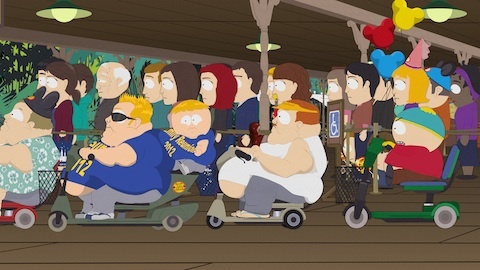 And based on this photo, Cartman may be having his own scooter-riding George Costanza moment. Going by the balloons, I'm going to guess he's at Disney World? South Park airs Wednesdays at 10:00 p.m. ET on Comedy Central.